as a smile holds more meaning than words. A middle aged man was going through his mid-life crisis so he went out and bought him a new bright red Porsche. So he decided to take his new Porsche on a test drive down the interstate one day. He got up to about 85 mph and all of a sudden he saw this highway patrolman with his blue lights and siren blaring coming toward him. He decided he and his new Porsche would outrun the officer. So the man sped up to 95 mph,and then to 105 mph, but the patrolman was still coming. The officer looked at the man and said, “Have a nice day”. It was a busy morning, approximately 8:30 a.m., when an elderly gentleman in his 80’s, arrived to have stitches removed from his thumb. He stated that he was in a hurry as he had an appointment at 9:00am. While taking care of his wound, we began to engage in conversation. I asked him if he had another doctor’s appointment this morning, as he was in such a hurry. A flaw in one’s character will show up under pressure. 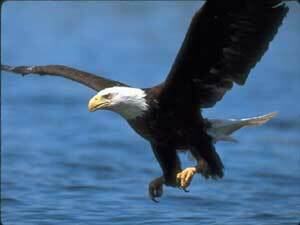 The eagle has the longest life-span of its’ species. It can live up to 70 years. But to reach this age, the eagle must make a hard decision. In its’ 40’s, its’ long and flexible talons can no longer grab prey which serves as food. Its’ long and sharp beak becomes bent. Its’ old-aged and heavy wings, due to their thick feathers, become stuck to its’ chest and make it difficult to fly. The process requires that the eagle fly to a mountain top and sit on its’ nest. There the eagle knocks its’ beak against a rock until it plucks it out. After plucking it out, the eagle will wait for a new beak to grow back and then it will pluck out its’ talons. When its’ new talons grow back, the eagle starts plucking its’ old-aged feathers. And after five months, the eagle takes its’ famous flight of rebirth and lives for… 30 more years. Many times, in order to survive we have to start a change process. Only freed from past burdens, can we take advantage of the present. Q?.How can you drop a raw egg onto a concrete floor without cracking it? This is a famous paper written for an Oxford philosophy exam, normally requiring an eight page essay answer and expected to be backed up with source material, quotes and analytical reasoning. This guy wrote the below answer and topped the exam! though it was a very large mammal its throat was very small. The little girl replied, “Then you ask him“.